As the UK demand for watercress has grown over the last 10-15 years, we at The Watercress Company have needed to look further afield to farms in Spain and the USA to ensure a constant 12 month supply for our customers. One hundred years ago, around 1,000 acres of watercress beds existed around the UK; today, only 150 acres remain, concentrated in Dorset and Hampshire. We are planning to open more beds there in the not too distant future but as the popularity of watercress grows in the States, our farms there are going from strength to strength, gaining a reputation for healthy, delicious watercress grown using traditional methods in flowing spring water, just as in the UK. And, like the UK, they are also a haven for wildlife from birds, to insects to mammals. Morgan Jaffray is the Production Manager at Watercress Farms Inc in Florida and is keeping a keen eye on what is spotted on and around the Farm. The sunny Florida farm is a year-round green oasis, and a sanctuary for a wide variety of wildlife; the constant supply of fresh water combined with the green grass fields attracts many species of birds, critters, snakes and reptiles, and larger mammals such as whitetail deer, hogs, black bears and even the rare and endangered Florida panther. 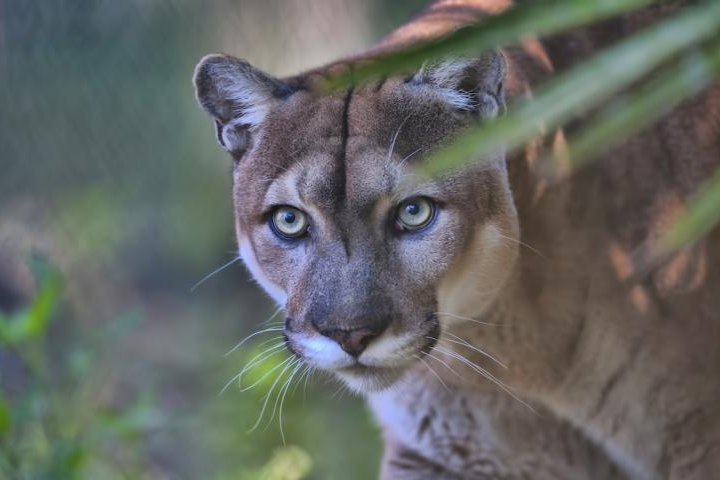 Florida panthers are spotted at birth and typically have blue eyes. As the panther grows, the spots fade and the coat becomes completely tan, while the eyes typically take on a yellow hue. The panther's underbelly is a creamy white, and it has black tips on the tail and ears. In 1982, the Florida panther was chosen as the Florida state animal. Watercress Farm Inc are popular with birds too and the most common breeds found around the farm are quite spectacular, most of which are protected by the Florida Wildlife Service. Standing well over a meter tall, these giant birds are common around Florida, often found in small groups or pairs. They are year-round residents in Florida, numbering around 4,000 to 5,000, and are joined in the winter by over 25,000 greater sandhill cranes (the larger of the two subspecies) migrating from their nesting grounds in the Great Lakes. Cranes live to be older than most birds, some reaching over 20 years old, and they live on a diet of insects, worms, mice, lizards, small birds and crayfish. They are closely related to the almost extinct Whooping Crane, which is subsequently being reintroduced into Florida in small numbers. The flamboyant Roseate Spoonbill looks like it came straight out of a Dr. Seuss book with its bright pink feathers, red eye staring out from a partly bald head, and giant spoon-shaped bill. For most people, finding a Roseate Spoonbill requires a trip to the southeastern coast of the United States or even farther afield to Mexico or Central and South America, however on a farm tour to see our watercress, you will often find these birds wading in the shallows looking for small aquatic critters. The round-headed, blue and gray Florida Scrub-Jay is the only bird species that lives exclusively in Florida, where it occurs in patches of low-growing scrub oak in sandy soils, which Watercress Farms has in abundance. Florida Scrub-Jays are homebodies; they don't migrate, rarely move more than a few miles from where they hatched, and they don't like to move across areas that aren't scrub oak, which means that our squatters will never move out… thankfully! With a wingspan of over two meters, the Bald Eagle has been the national emblem of the United States since 1782 because of its long life, great strength and majestic looks, and also because it was then believed to exist only on this continent. However, the Bald Eagle had been a spiritual symbol for native people for far longer than that. The Native Americans consider the bald eagle and the golden eagle to be sacred. 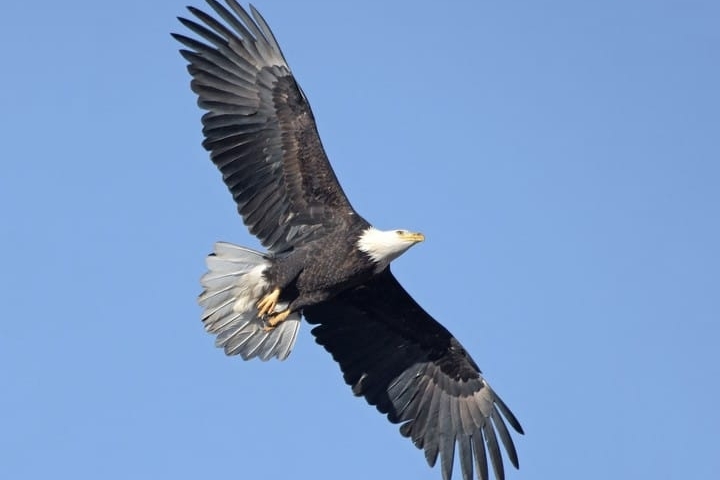 As eagles are the highest flying birds they were seen to be nearer to the Creator. Eagle feathers were highly significant to the Native American Indians and the bones of eagles were used to make the whistles and flutes used at religious ceremonies and rituals. It was a custom to hold an eagle feather aloft when saying a prayer and during special council meetings eagle feathers were held as an assurance that the person was telling the truth. Eagle feathers also held a connection to the Great spirit. The eagle had the ability to live in the realm of spirit, and yet remain connected and balanced within the realm of Earth. The eagle is therefore often connected with balance. These regal birds aren’t actually bald, but their white-feathered heads gleam in contrast to their chocolate-brown body and wings. Look for them soaring in solitude, chasing other birds for their food, or gathering by the hundreds in winter. Once endangered by hunting and pesticides, Bald Eagles have flourished under protection. Come by again to see what other creatures visit the farm in my next post.